Spring is right around the corner, and some of the season’s best vegetables are already available. One spring favorite, asparagus, is an excellent source of several vitamins, including A, C, E and K, and is also low in calories. 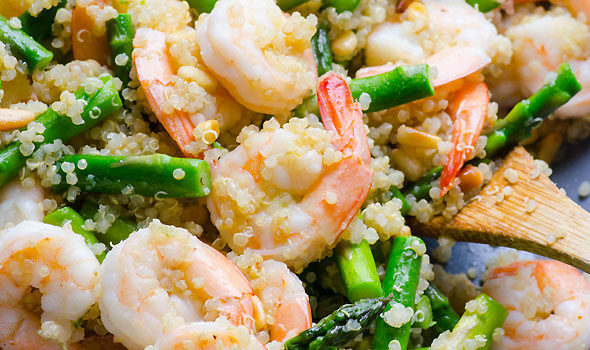 During this Lenten season, shrimp are a great way to add protein. Try this great recipe with your family! Heat oil in a large skillet over medium-high heat. Add asparagus and garlic, and cook about 2 minutes, stirring frequently. Add shrimp and continue to cook for 5 minutes. Reduce heat to medium-low and stir in tomatoes. In a small bowl, combine broth and cornstarch. Slowly pour mixture into skillet with shrimp and vegetables, cooking gently until thickened. Add thyme, salt and pepper. Squeeze lemon over all. Serve shrimp mixture over quinoa. For more nutrition information, click here.